The YMA on Wednesday organised a state wide rally for scraping of the Chakma Autonomous District Council (CADC) in south Mizoram. 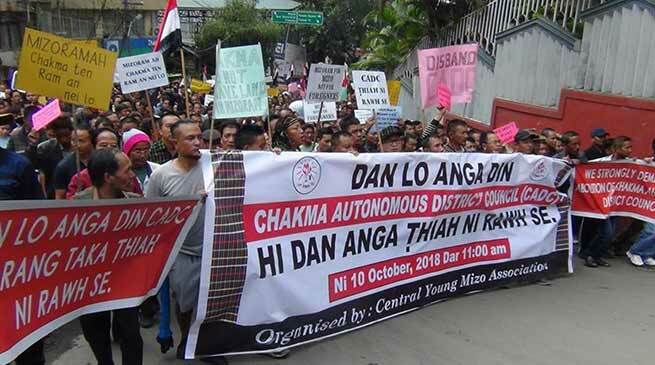 The Young Mizo Association ( YMA ) on Wednesday organised a state wide rally for scraping of the Chakma Autonomous District Council (CADC) in south Mizoram. Thousands of people participated in the rally here, holding placards and shouting slogans. The rally was organised in major towns and villages, making it the largest rally in Mizoram in recent times. In its general conference held at Zotlang village in Champhai district from October 17 to 19, the Young Mizo Association passed a resolution to take legal steps for the abolition of the CADC which was “constituted illegally”. YMA President, Vanlalruata said the CADC was “unconstitutionally” created in 1972 when Mizoram (then the Mizo Hills district of Assam) was elevated to a Union Territory, without the consent of the Mizo people. “Chakmas are not the indigenous people of Mizoram. They originally belonged to the Chittagong Hills Tract in Bangladesh who migrated to Mizoram in the 1960s due to construction of the Kaptai dam. They were refugees who were illegally given an autonomous district council,” he said. Vanlalruata said the state wide rally was to express the solidary of the Mizos and create public awareness. “Our next course of action will be to take legal steps. We will go to the Supreme Court,” he said.